What Vinod Mehta had, in two words, was ‘editorial chemistry’. Dina Vakil, a Mumbai editor who had worked with him at The Indian Post, coined the phrase and captured what it meant in an e-mail she sent me soon after I began working for Mehta at Outlook magazine. No wonder, then, that for every proprietor who dispensed with Mehta’s independent-minded editorship, after finding it politically expensive, there was always a new one coming along, sooner or later, asking him to launch or resuscitate something. These firings and hirings, which Mehta came to wear as badges of honour in his later years, when the tumult became a distant memory, are narrated with relish in the two books that contain his memoirs, Lucknow Boy and Editor Unplugged. His own errors of judgment are not omitted, including a colossal one that forced him to resign from the editorship of the Independent newspaper in 1989, 29 days after launching it. A story based on a dubious RAW report, calling Maharashtra strong man YB Chavan a spy, which Mehta ran with an eight-column banner headline, blew up in his face. While his first assignment, the relaunch of the girlie magazine, Debonair, contributes great colour to the legend of Vinod Mehta, his reputation was built on his second one, Sunday Observer. Launched in Mumbai in 1981, on a shoestring budget, and with the kind of small, overworked, underpaid team Mehta reveled in spurring on, with a string of expletives and yet, remarkable accessibility, this was a newspaper Indian readers had never seen before. It was as different from the largely staid newspapers of the day as the unorthodox and open-minded Mehta himself was from, say, Girilal Jain, the then editor of the Times of India – an “ivory tower” editor with strong political leanings, rarely to be seen in the newsroom. Sunday Observer was sharply designed, and bursting with lively political stories and columns, sometimes by little-known writers that Mehta had decided to take a bet on. Featuring the first oped page in the Indian media, first rate coverage of the arts, and a feisty letters page, it was the sort of irresistible mix that Mehta would whip up, time and again, when he was given enough rope. At Outlook, Mehta had a 17 year run, a luxury he had never enjoyed before. Frequently appearing on TV, and becoming a fixture on Delhi’s social circuit, he could have turned into an establishment figure. But he remained refreshingly free of pomposity and self-regard, and he did not lose his appetite for risk. As Editor Unplugged reveals, his bold decision to publish the infamous Radia tapes, which most of the media knew about but did not want to touch, led the Tatas (featured in the tapes) to withdraw advertising from Outlook, and strained his relationship with the magazine’s owners. Eventually, Mehta had to step away from the editorship, and the newsroom, and become editorial chairman. 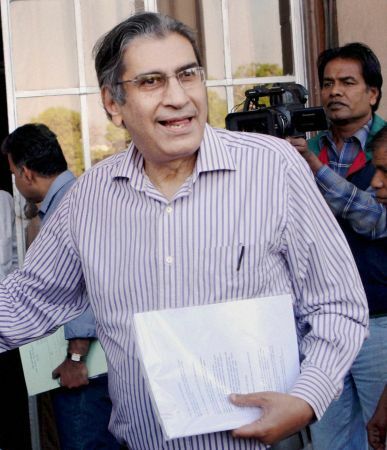 As an editor, Vinod Mehta had a style inimitably his. A complex man -- he makes the startling admission in Editor Unplugged that he has never known what is to fall in love -- he exuded, at once, self-contained aloofness and deep engagement with his passions. It was sometimes said of him that he infinitely preferred creatures with four legs than with two. There were daily reminders that this sad hypothesis might well be true, and not just in besotted references in his columns to his dog, Editor. As you left the office in the evenings, you invariably saw stray dogs milling around the front entrance, waiting for numerous packets of milk to be opened, all courtesy Mehta. But, then, there was the equally curious sight of young shoe-shine boys and beggars crowding around him when he emerged from the office. Not the most expansive paymaster, and a great believer in no-frills offices (one memorably, even lacked a proper loo), Mehta was yet a generous tipper. When encountered in office corridors, Mehta studiously avoided eye-contact, but if you ran into him at a party later in the evening, he was loquacious and genial, especially if he had had a drink or two. When you met him after you had stopped working for him, he greeted you like a long-lost friend. Perhaps the hardest thing to forget about Vinod Mehta is the air of childlike excitement about him when he thought a story was worth chasing. He not just gave a reporter untrammelled freedom to run with a good story, he actually ran alongside. A ferociously engaged editor, at his peak, he took afternoon naps with his feet up on his desk, but by evening was pacing up and down, sneaking up behind reporters to read over their shoulders, and even reworking layouts with split-second speed. At editorial meetings, his eyes lit up at the hint of scandal and controversy, and he was deeply suspicious of what he saw as preachiness or pretentiousness in a writer, though sometimes respectful of genuine erudition and originality. The worst thing he could say about a prospective columnist or a book reviewer was “boring as hell”. Stories are legion about Mehta’s knack of packaging a story more boldly than a nervous reporter had intended, especially since he was never too weighed down by political correctness. Once, in his Mumbai days, he famously gave a serious piece by a feminist writer on the pressures on women to conform to depilation and conventional norms of femininity, the headline: “I love my hairy legs”. While, as editor in chief, Mehta towered over his Outlook team in age and reputation, it was remarkable that he never presented himself as an omniscient figure. He seemed to know exactly who he was: not a lofty intellectual but an editor with a strong instinct for what would be read, and one with a great talent for managing a diverse, and sometimes disorderly, crew. It was his insatiable curiosity for any kind of story, weighty or frivolous, that helped this elderly man, who was so computer illiterate that handwrote his columns to the end, establish a rapport with the youngest members of team. It was striking how open Mehta was to being contradicted, and even being overruled, at noisy editorial meetings. But of course, the tough decisions, like the one to run with the Radia story and annoy some very important people, were always his. Unlike some of his peers, he took them for the purest, most uncomplicated, of reasons -- that these were “bloody good stories” and he had a magazine to sell.